INCOME is money that people earn. 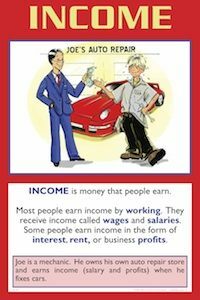 Most people earn income by working. They receive income called wages and salaries. Some people earn income in the form of interest, rent, or business profits. Example: Joe is a mechanic. He owns his own auto repair store and earns income (salary and profits) when he fixes cars. Income is money that people earn. Most people earn income by working at jobs. They receive income in the form of wages or salaries. In fact, about three-fourths of all the income earned in the United States comes from wages or salaries, including fringe benefits. The other fourth of income earned in the United States goes to owners of capital resources (tools, equipment, buildings, machinery, etc.) in the form of rent, profit, and interest. The income workers earn varies greatly from job to job, and even within jobs. Why is this? Students should understand that wages are determined by the forces of supply and demand in the market for productive resources (human, natural, capital). And the demand for workers is influenced primarily by the value of what they produce. In other words, highly productive workers who help a firm earn more profits will be in higher demand than less productive workers. This explains why some people, like sports stars, are so highly paid. Their services can result in huge profits for team owners. So what does all this mean for your students? It means that they should consider carefully which jobs businesses will demand in the future. To increase their chance for higher incomes, it also means students should take steps to increase their productivity, thus making themselves more valuable to businesses. This acquiring of human capital usually happens through more education, training, and experience. Invite a human resource person from a business to the class to discuss skills and qualities the business is looking for in employees. Make sure the class prepares questions to ask before the person comes. The United States Bureau of Statistics has a comprehensive web site on the labor market. Have your students examine the wages and salaries of hundreds of occupations at www.bls.gov/oes/current/oes_nat.htm. A better site for your students to use is the Career One Stop (www.careeronestop.org). Click on "Other In-Demand Occupations" on the left column of the web site. To find good employment, students should consider not only the demand for a particular type of job, but also their own skills and interests. Have each student create a Skills and Interest Profile. They should share and discuss this profile with other classmates. Have students create a bulletin board using data from 1 above, especially Career Voyages. It could be entitled, "Hot Jobs for the Future" and list wages, projected growth rates, salaries, and education/skill requirements.